A view of the Ward from the top of the T. Eaton factory in 1910. Photo from the City of Toronto Archives Fonds 1244, Item 596. The Another View of the Ward Heritage Toronto walking tour promises a deeper look at one of Toronto’s historically most maligned and now mostly forgotten neighbourhoods. St. John’s Ward, usually just called “the Ward,” was the area between Yonge Street, University Avenue, College Street, and Queen Street. Few traces of this neighbourhood remain today, because it was cleared to make way for development, including City Hall, in the 20th century. The tour visits sites that would have been bustling streets filled with voices speaking in languages from all over the world and children all playing together. Many of these streets are now big office blocks, stores, and parking lots. 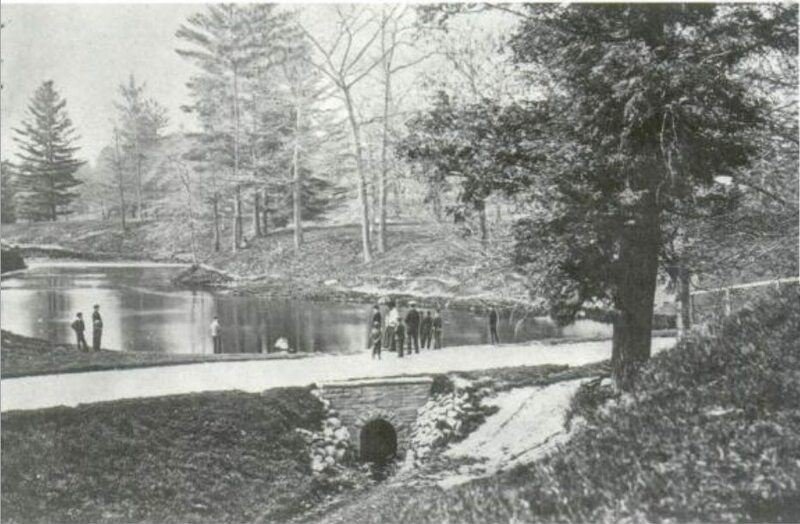 Taddle Creek dammed to make McCaul’s Pond at UofT in 1869. Photo via Wikimedia Commons. The tour gathers near Holy Trinity Church just outside the Eaton Centre. The shopping mall opened in 1977 near the site of the T. Eaton factory that used to watch over the area. 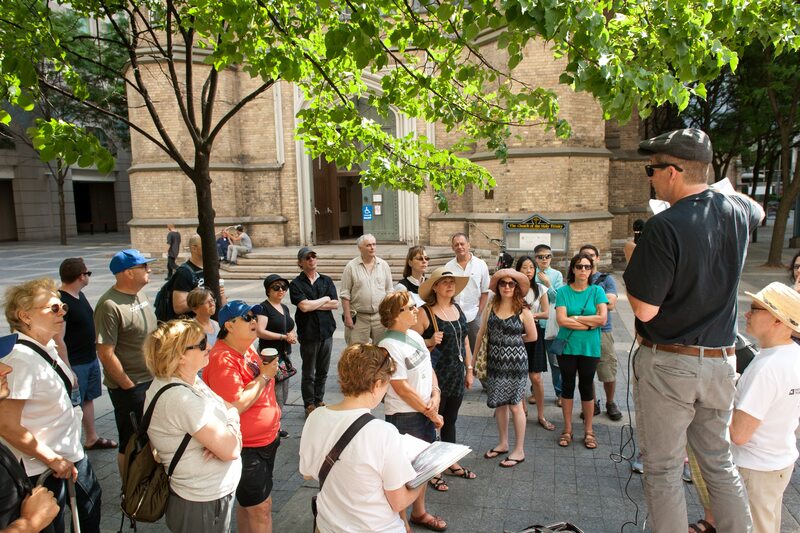 The tour was led by John Lorinc and Ellen Scheinberg, two of the editors of the Heritage Toronto Award-winning 2015 book, The Ward: The Life and Loss of Toronto’s First Immigrant Neighbourhood. They started off with the Indigenous history of the area. No specific First Nations settlements have been found around City Hall, but some artifacts were uncovered during the building of City Hall. Taddle Creek used to run through the area, but is now buried, and would have been a significant gathering spot for Indigenous people. A Glimpse of the Ward tour in 2016. Photo by Herman Custodio and used courtesy of Heritage Toronto. James Macaulay was granted 100 acres of land along Queen Street (then called Lot Street) in the 1790s and started dividing up the land for houses. This area became known at Macaulay Town in his honour and Lorinc described it as Toronto’s first suburb. It was absorbed by the city in 1834. The house prices were fairly low, and Macaulay Town was a pleasant working-class neighbourhood. After it joined the city, the area became an arrival city, as waves of immigrants came to the shores of Lake Ontario. In the 1840s, it was the Irish who arrived in huge numbers. The total population of Toronto was around 20,000 and over 38,000 Irish immigrants (or refugees) landed in the city as they escaped an Gorta Mór (the great hunger, often called the great famine or potato famine). Many of the arriving Irish settled in the Ward. In the 1840s and 50s, the area’s Black population grew as refugees escaping enslavement arrived from Niagara and Windsor. In the 1880s and 90s, Italian immigrants started the city’s first Little Italy. The 1890s also saw the arrival of Eastern European Jews, many refugees of pogroms in Russia. A stable yard in the Ward in 1907. Photo from the City of Toronto Archives Fonds 1244, Item 313. 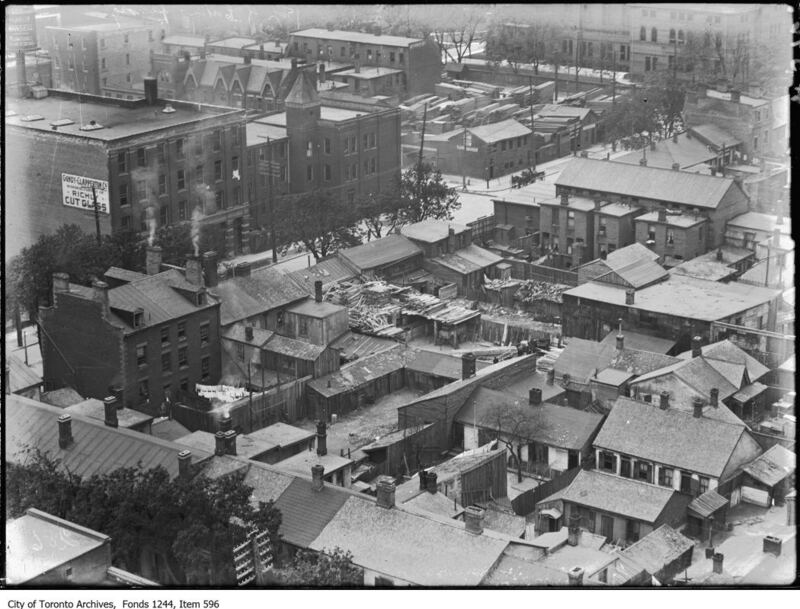 Through the 1890s to the 1920s, the area faced a housing shortage (much like Toronto is seeing today) and many of the cottages in the Ward were overcrowded. Families built houses in their backyards to fit more people and it became one of the densest neighbourhoods in the country. In the 1920s, Jewish residents started moving towards Kensington Market and more Chinese immigrants and descendants of Chinese immigrants from B.C. started moving to the Ward, which became Toronto’s first Chinatown. The sights and sounds of a multicultural, crowded community were unfamiliar to many Anglo Torontonians and the Ward became associated with dirt and disease. It also had the first gay and lesbian bars in the city and some of the oldest cruising sites, now paved over with big box stores on top. Looking around the wide streets today, it can be hard to imagine the noisy, dusty, vibrant, smelly community it would have been. From the Eaton Centre, the tour travels to sites where famous artists took inspiration (and drank, certainly in the case of Ernest Hemingway who visited Angelo’s, an Italian restaurant, often while a reporter for the Toronto Star), where musical families got their start, sites where community centres catering to the many young and working children once stood, and sites where there were some of the first Jewish and Chinese restaurants expanding the bland tastes of Toronto. 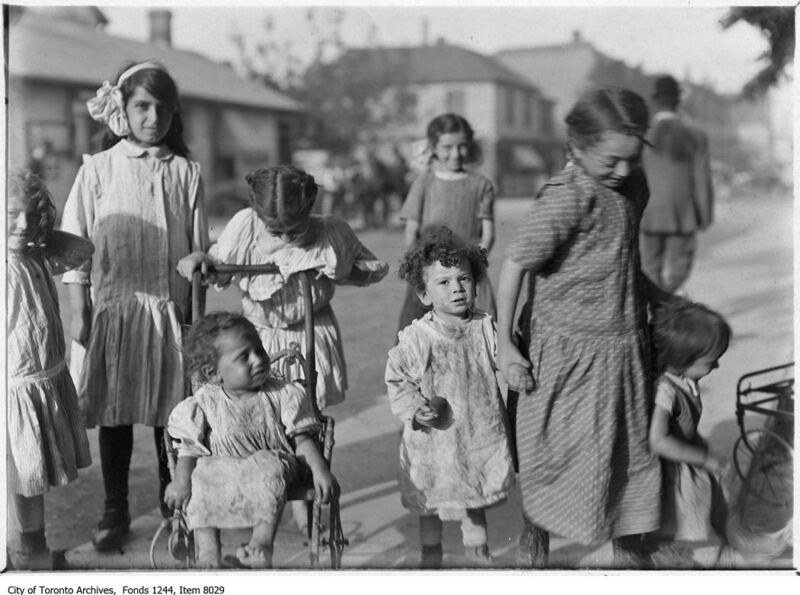 Children living in the Ward c. 1911. Photo from the City of Toronto Archives Fonds 1244, Item 8029. As different communities arrived in the city, new houses of worship were built to cater to them. First, Catholic churches, then African Episcopal and Methodist churches, and later synagogues, Scheinberg explained. As the Jewish community became more visible, missionaries also moved into the Ward, hoping to convert these new immigrants. They weren’t very successful, but the stories of their attempts to win the hearts and stomachs of the local children are a tour highlight. One of the best visual records we have of life in the Ward (apart from Lawren Harris’s paintings) are photographs from the City’s health department taken by Arthur Goss. 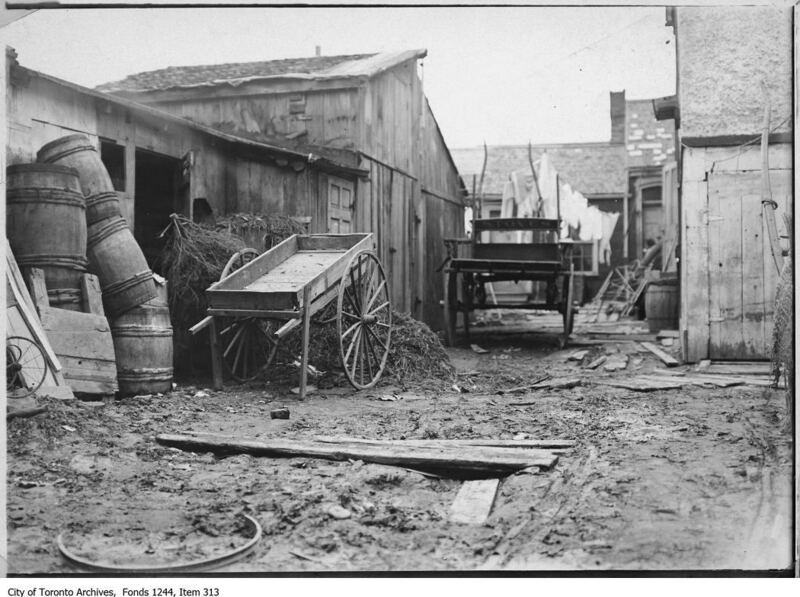 Scheinberg and Lorinc pass around examples of paintings and photographs to help give a sense of what the neighbourhood looked like, but they also note that Goss was sent by public works and public health to show how the Ward was dirty and overcrowded. Scheinberg and Lorinc both have an incredibly deep knowledge of the tapestry of life in the Ward and have spoken to the descendants of some of the community leaders from various points in the neighbourhood’s history. Their expertise and anecdotes bring to life one of Toronto’s lost neighbourhoods. The tour leaves from Trinity Square near the Eaton Centre and lasts around an hour and a half. The next Another View of the Ward tour is Thursday, September 21 at 6:30 p.m. The 2017 Heritage Toronto Tour season runs from May to October. This article is brought to you by Heritage Toronto.